Last summer I participated in a wonderful vintage blogging party and wow, it was fun! I had to stretch a bit to find my “vintage” side, but I found it via how to make your own Scripture Tea bags. I have to admit that for me, this type of crafting is more of a special occasion or project; I’m not an everyday crafter. However, you don’t have to make your own tea bags using coffee filters and loose leaf tea to make Scripture Tea gift sets. You can simply use the free printable tea tags to replace the tags on your favorite tea bags. With Mother’s Day approaching, the Scripture Tea gift ideas have been floating around in my mind. Then I saw that my friends at Dayspring have some beautiful tea sets on clearance! Woohoo! 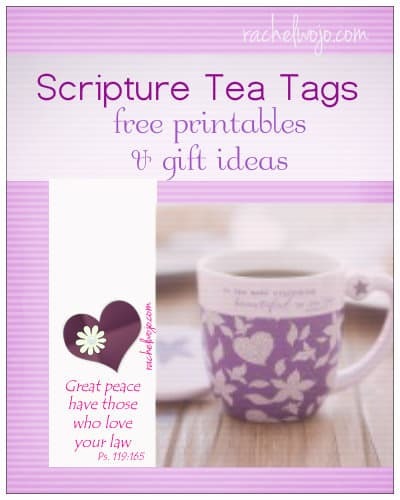 So I created a couple more Scripture Tea Tag printables for you. It would be such a great Mother’s Day gift to pair with a handmade set of Scripture Tea tags! The red or lighter blue Scripture tag would be a great match with this cup. Honestly, I couldn’t choose just one. But I hope this gives you an idea or two for any upcoming spring birthday gifts or Mother’s Day gift ideas. Wouldn’t it be lovely to give all of your church staff ladies or pastor’s wives a tea cup, set of Scripture Tea bags and a personal note for Mother’s Day? Also, I know some of you host traditional mother/daughter teas and a very simple gift idea would be to place a single Scripture tea at each place setting for your tea, either to use during the event or as a take-home prize. If you’re too busy to do any printing or cutting, but love the idea of Scripture Tea, then you can buy your own right here. I’d love to hear if you have a favorite! Have a great weekend! Be sure to follow us on Facebook to stay tuned for all the encouragement! Disclosure: Post contains affiliate links. Site may be compensated if purchase is made. See full disclosure policy here. So fun and unique ideas. Makes me think Spring! Oh, Rachel, I forgot to mention, your link to purchase the Scripture tea is broken. Thank you Friend! So much- repaired now. Appreciate you! Great idea, everyone loves tea. I would love to hear when you have nee products and would like to know about.ordering tea bags and tea cups. Jeannine- If you click through the colored links, you will find the sites where you can place orders for the items. Thank you for inquiring!